I mentally tucked this recipe away in my head a few weekends ago. In typical fashion I was flicking through all my books, magazines and Pinterest trying to figure out what I felt like making for dinner. Flicked past this recipe and thought yum- but not today maybe in a few weeks time. This recipe is from Neil Perry’s spice temple cook book but I’m sure if you google you could find a similar recipe online. 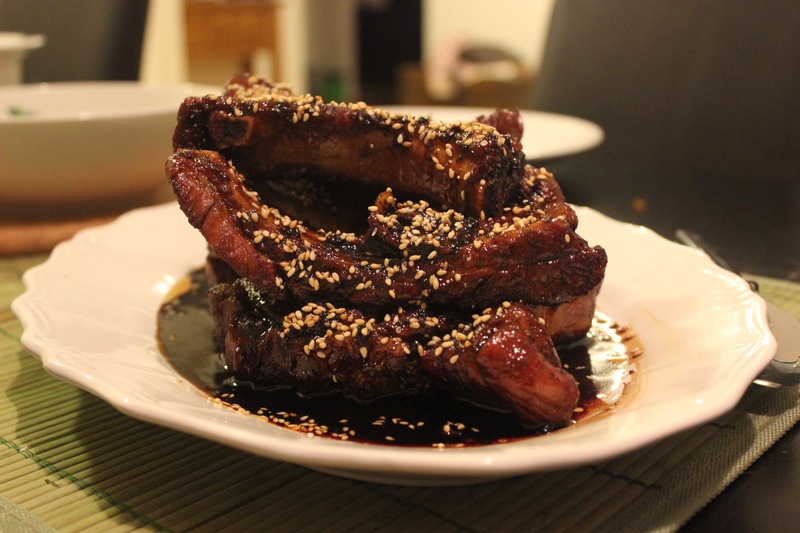 Recipe seemed pretty straightforward- simmer the ribs in aromatics and cool, tea smoke the ribs and then stir fry in a sticky delicious sauce. Simple! So for the first part of the process I took no photos, and for a good reason. Water, salt, ginger, garlic, spring onions and the ribs are combined, brought to the boil, simmered for a few minutes and then left to cool in the liquid. Reason for no photo? Boiled pork ribs are really ugly- they ain’t pretty. 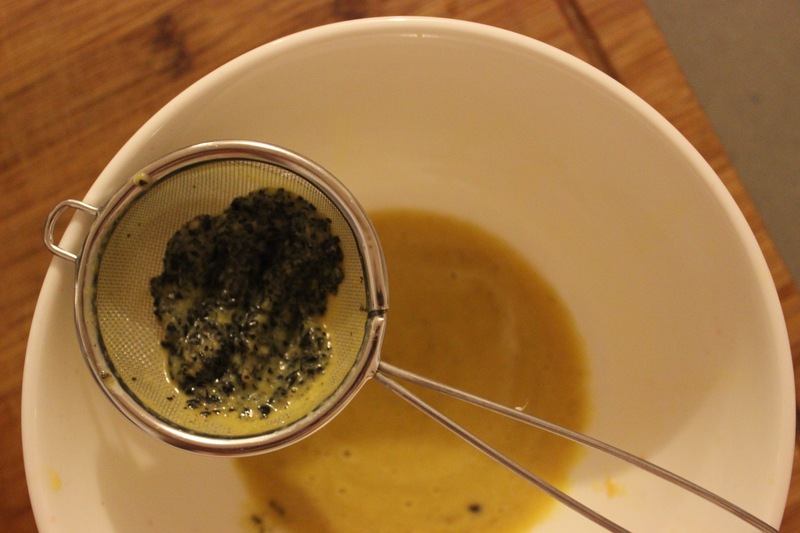 Let’s move onto something a little more photogenic- making the tea smoking mixture. This is something I’ve wanted to try for years so I was looking forward to giving it a go. 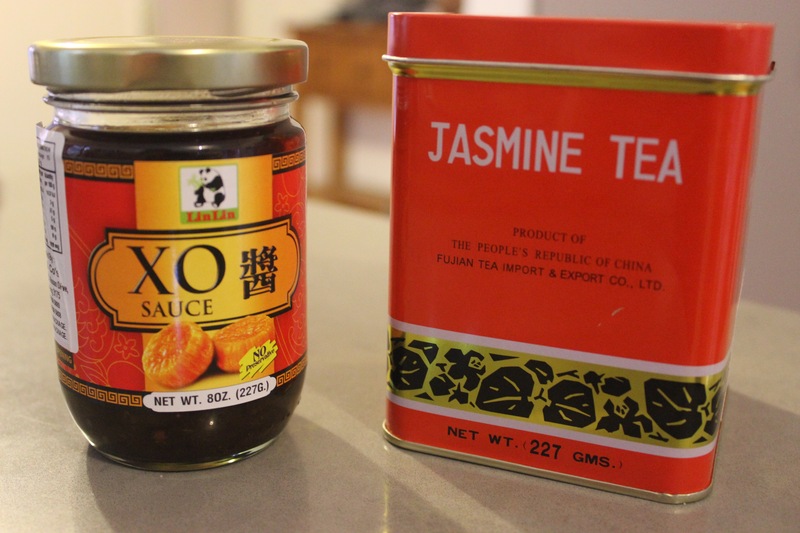 Making the smoking mix is straightforward- mix brown sugar, jasmine rice (uncooked) and jasmine tea together- done! The next bit took a while- setting up the smoking station. 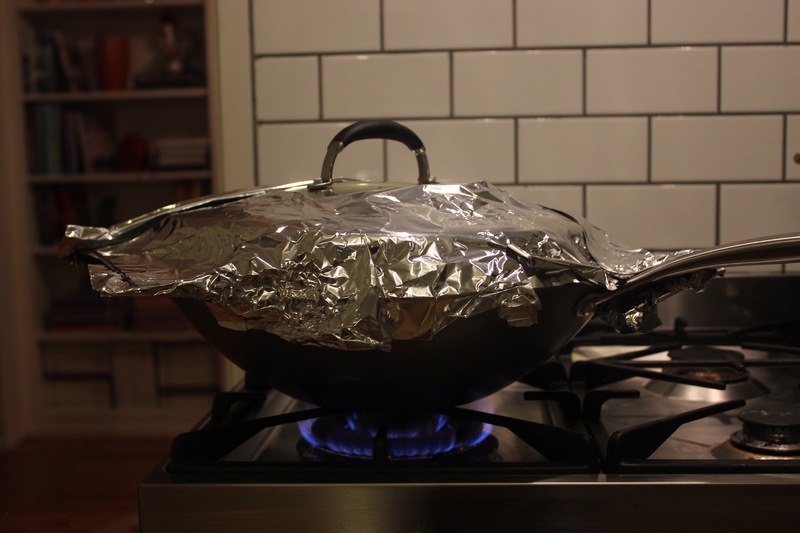 I made a wide bowl out of foil, popped it on the bottom of the wok and tipped the smoking mixture in. Popped a lid on top, turned the heat to high and then patiently waited until the mixture started smoking. Unfortunately I didn’t have a small wire rack that could sit inside the wok so I had to get creative. Once the mixture was smoking I balanced the wire rack on top of the wok, assembled the ribs over the smoke mixture and then delicately placed the lid over the top of the ribs. I had exposed sides all around the edge of the wok which mean I was losing smoke out the sides- so out came the foil and I patched it up. Ribs smoked for 5 minutes and then you switched off the heat and left it for another few minutes- longer if you wanted them pretty smoky- I found just waiting another 4 minutes was more than enough- they smelt amazing! However even with the range hood fan cranked up the house was a little smoky- just a warning! 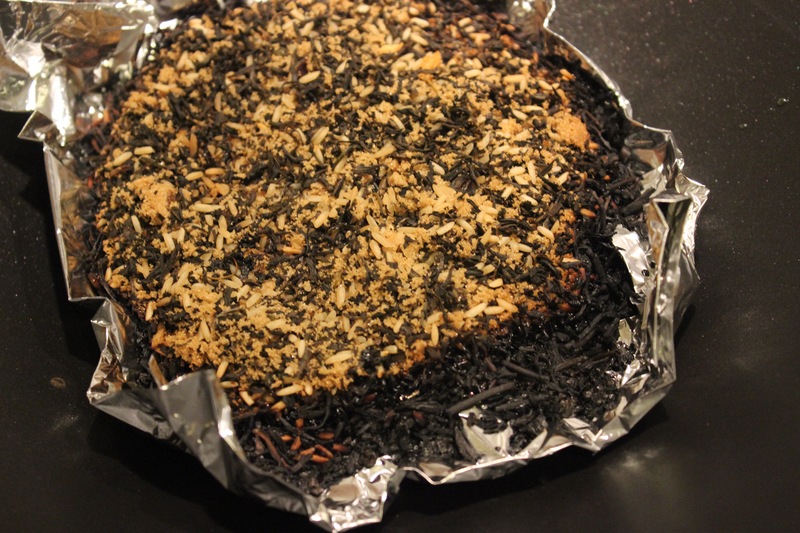 Here’s what the smoking mixture looked like afterwards- charry around the edges and it had solidified- I think that the sugar had probably melted and glued everything together! 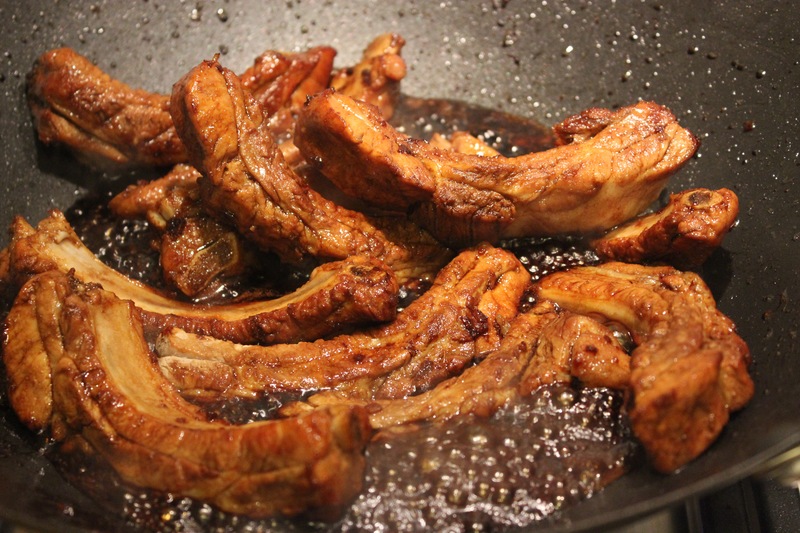 Last step- make the caramel and stir fry the ribs in it. Stir fried garlic and ginger, stirred in sugar and waited until it became a deep caramel colour. Stir in black vinegar, dark soy sauce and a small amount of chicken stock and cook until slightly thickened. Add the ribs and continue to stir (this is hard with ribs, so in my case stirring ribs was more like picking up and moving them in the wok with some tongs, less chance of them going overboard!) Cook until the mixture coats the ribs and looks lovely and glossy. Action shot- look at the caramel bubbling up at the sides. Pile onto a platter, sprinkle with sesame oil and sesame seeds. Get plenty of napkins ready because this is messy but worthwhile work- also helps if you have a spare bowl to toss the bones into. These were really good- the smoke flavour was really pronounced and the sticky soy vinegar sauce was so good. Only thing next time might be boiling the ribs for a little less time- only criticism was that these were a little dry but that didn’t stop us from hoovering them down! Definitely want to try tea smoking again but I think I need to sort out a better arrangement for next time! 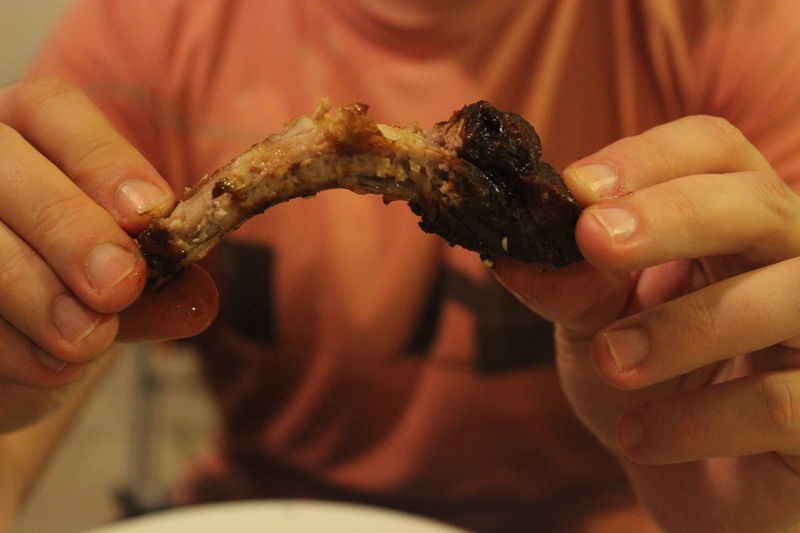 Also wishing I had more ribs now instead of the dishes to do…. Ah well – have you tea smoked anything? Let me know! When it comes to eggs there can be two kinds of people, those who insist on on only ever a hard boiled yolk and those who prefer to ride the rainbow of runny to not to runny. I see the role of the hard boiled egg mainly relegated to sandwiches and salads- everything else is fair game for some runny yolky goodness. So this brings me to the 5:10 egg- such a revelation! I’d had this recipe lurking in my bookshelves for years and years but it wasn’t until just before the last new year that I had discovered it. We had friends over for New Years dinner and I had earmarked a delicious recipe from David Changs book Momofuku (lucky peach). The recipe sounded (and once cooked) tasted sublime. 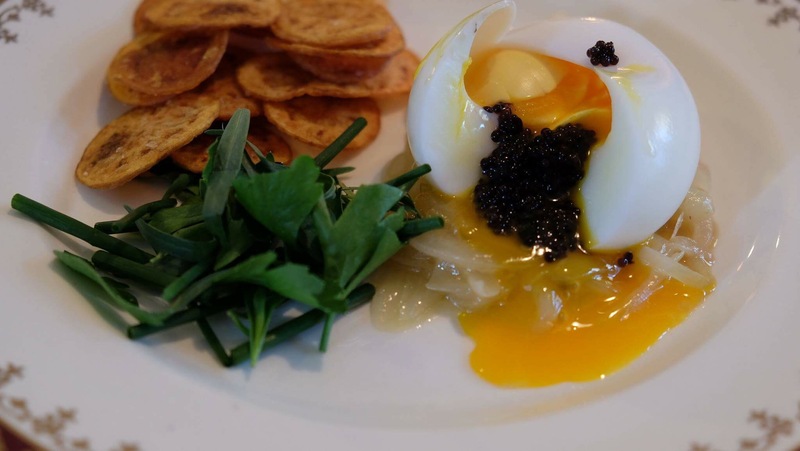 Soft runny egg served with a herb salad, home made potato crisps, caviar (or any form of fish egg) and a slow cooked onion soubise (very very very slow cooked onions in butter). Sooooo good. From this point you can leave the eggs in the fridge until you want to use them (can probably sit for a day or 2 max). 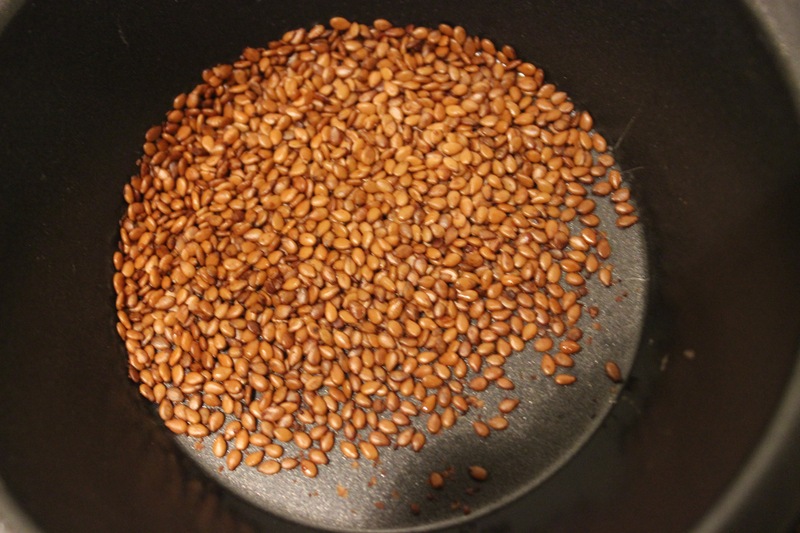 Then when ready to use just pop in some warm water either on or off the stove and gently warm them through and serve. Now… here’s the most glorious bit- cut into the egg and feel free to video in slow motion- it’s the most breathtaking sight- soft soft egg whites and the most delightful runny yolk…. I’ve made these several times- over salads, by themselves or one of the best yet over instant ramen noodles (the yolk just combines with the noodles in a way that it’s like a second sauce). I will make the dish with the herbs, crisps and onions again because it was really good- but these eggs…. seriously the best- and even better they are something you can prepare in advance- I prepped some last night and rewarmed this morning to serve with latkes and gravlax. Umami- it’s one of those words that tends to get thrown about on menu’s. This one I am ok with. Don’t get me started on things like ‘hand cut chips’ or ‘fresh salad’ or ‘deconstructed’…. Umami I understand- it’s the fifth flavour after sweet, sour, salty and bitter. We don’t have an English equivalent of the word but essentially umami is a ‘savoury’ flavour- and I love it! Salt added to some proteins, fish sauce, Parmesan, mushrooms and so many more exhibit an ‘umami’ flavour. 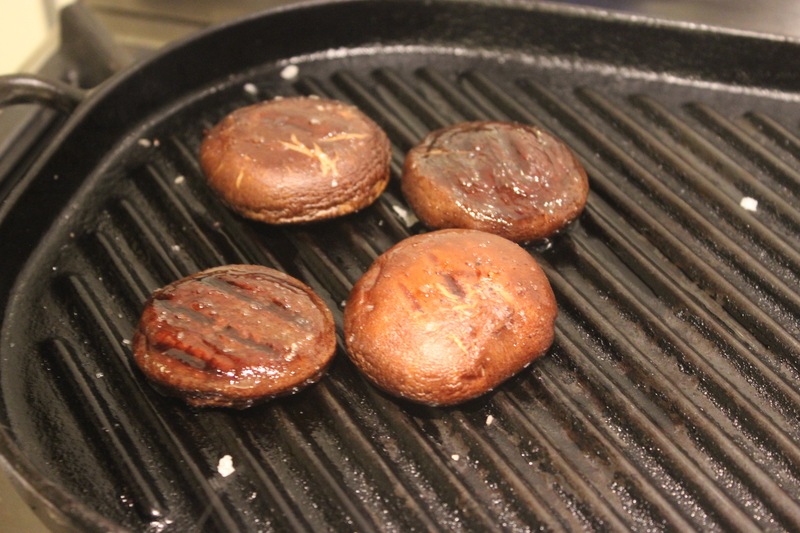 Pinned to my Pinterest board for a while I had Peter Gilmore’s (think Quay and the famous snow egg- Sydney) grilled shiitake mushrooms with umami butter. This week I decided it was happening. 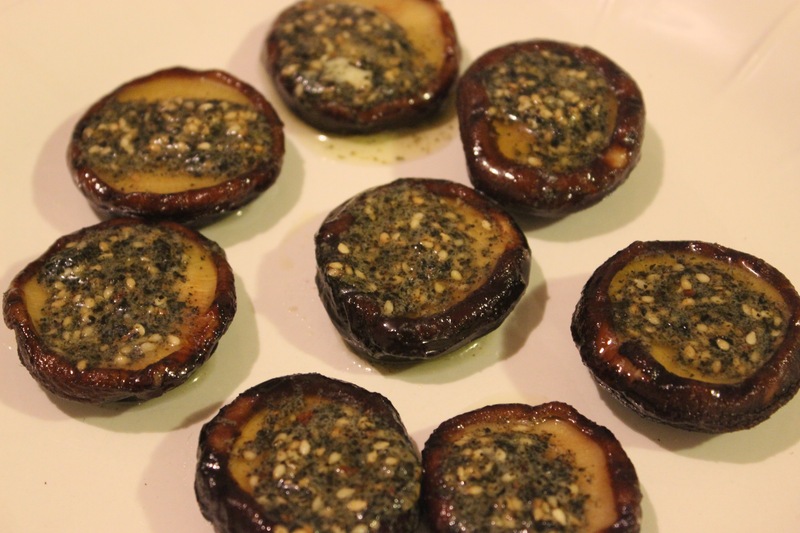 Super simple recipe– grilled shiitake mushrooms topped with an umami butter. This butter is filled with glorious things. 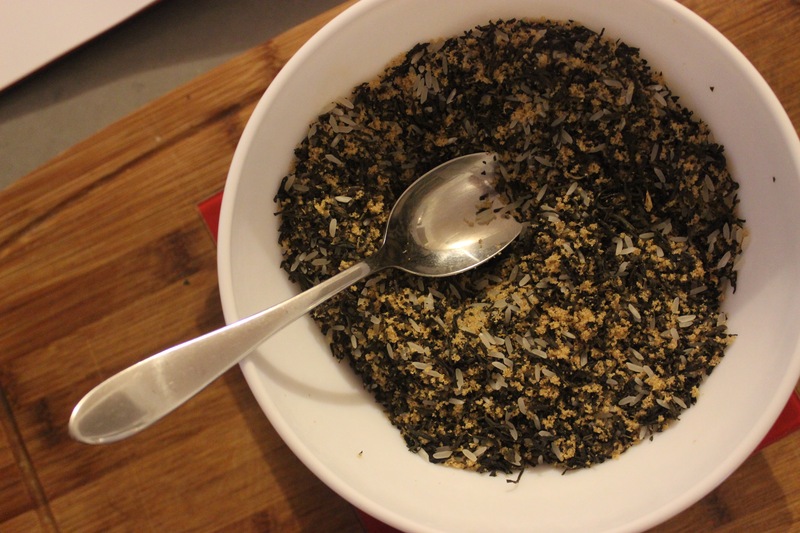 You start with softened butter and mix in some dried shiitake and dried seaweed that have been blitzed in a spice grinder, toasted sesame seeds, white miso, lemon rind and fish sauce- mmmmmm UMAMI! It’s not pretty I’ll grant you that but it’s really really tasty. 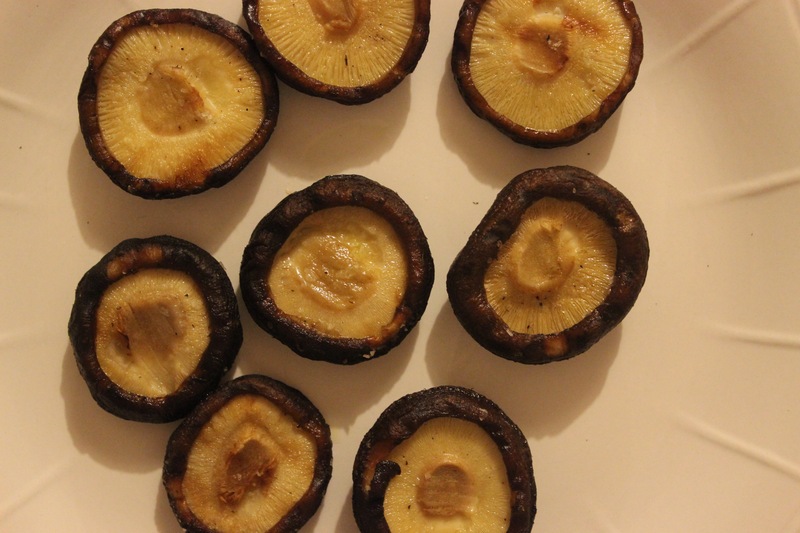 Next- take the stems off the mushrooms- on shiitakes they aren’t that lovely (when grilled) so slice them off and then coat with olive oil and salt..
Then it’s time to grill them- the recipe used a wood/coal bbq but I just used my cast iron grill pan over the gas- suitable alternative in my opinion. 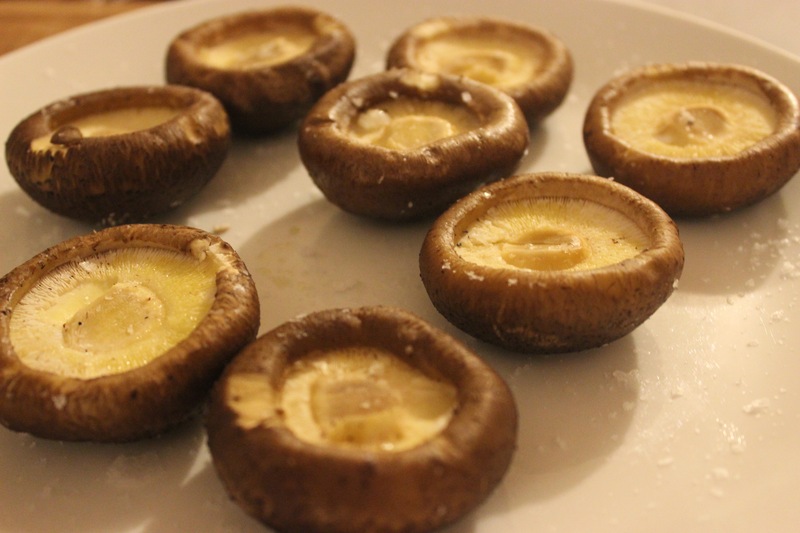 I then topped these with the butter and put the in a low oven while I got together the rest of dinner. 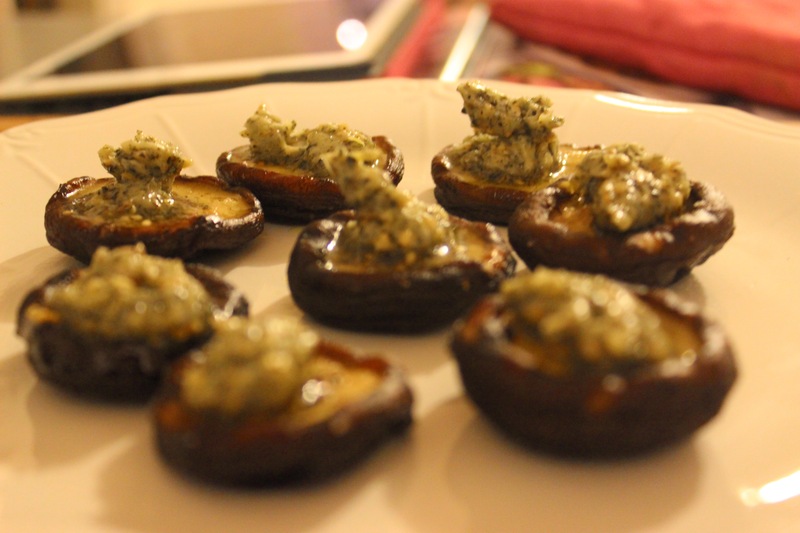 These were really good- I served them alongside a nice steak, baby spinach salad and a nice sourdough- these will be a make again and I think that this butter would go really nicely along with other veggies or even fish or chicken. 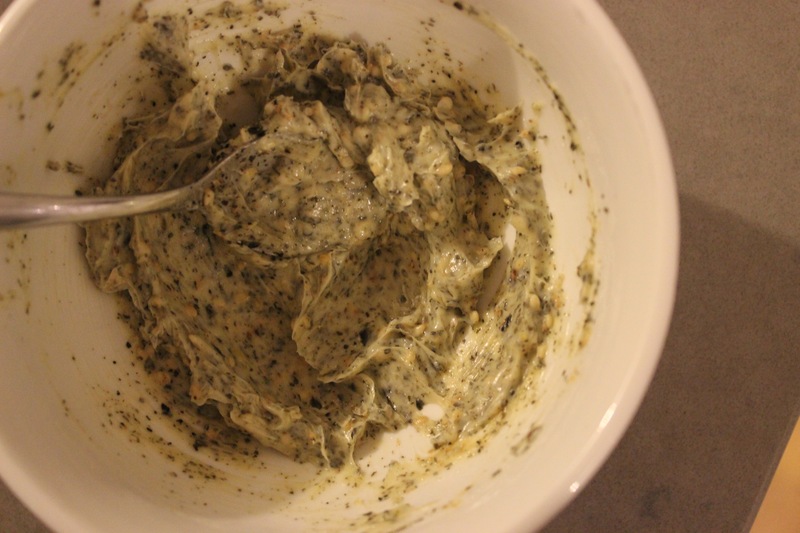 Give it a go- may sound strange ingredient wise but the flavour makes up for it. So I’ve knocked another item off ‘the list’- if you haven’t read my last post I’ve got a list of items/recipes that I will make, one day, when the time is right. 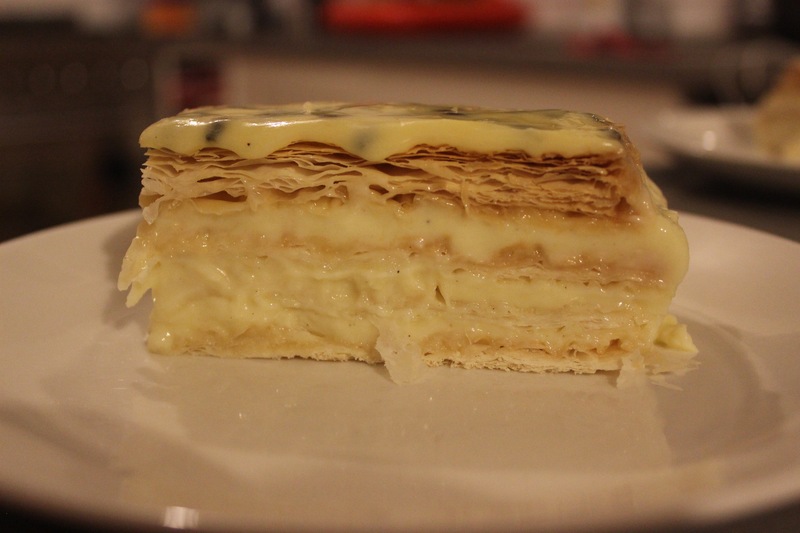 Vanilla slice, snot block, custard slice whatever you want to call it they are all fairly similar and it wasn’t until I decided I wanted to make it the other night I realised why I’d put it off for so long. Then it’s the filing, some are made like a custard cooking it with eggs, others are more cornflower based still cooked and thickened up with eggs at a later point. And assembly…. 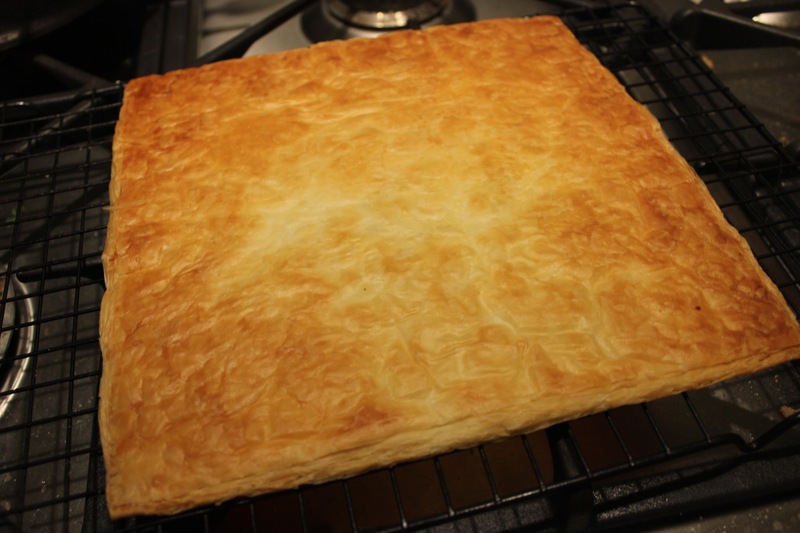 some just use 2 sheets of pastry and others use more, some use icing and some don’t- so many bloody variations! 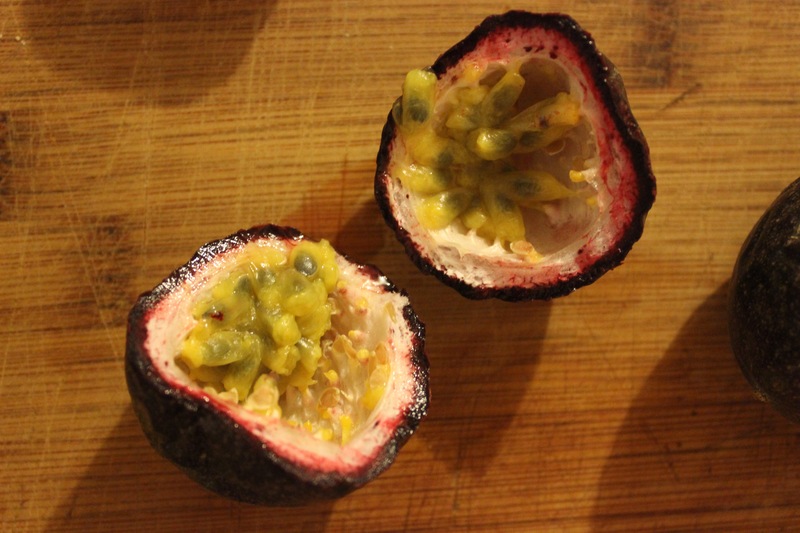 Looking through the myriad of recipes I decided on a passionfruit version– it was summer so good timing to give it a go. I didn’t realise unti I purchased said passionfruit how the pressure would really be on for it not to be a failure because in total it was $12 worth of passionfruit alone! To trim to pan size I just used a serrated edged knife and it cut really easily (may have sampled some of the off cuts)- now onto the filling. 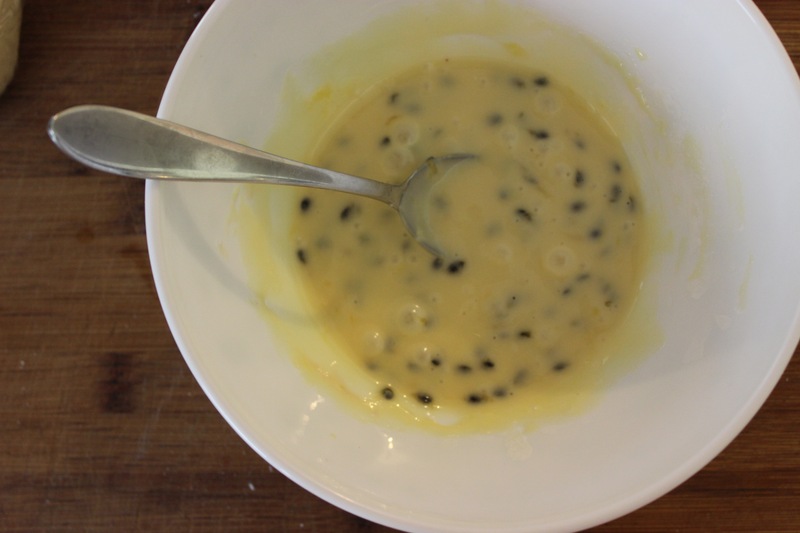 This recipe was a cornflour thickened passionfruit cream cooked until thick and then egg yolks and butter stirred through afterwards- took a while to get to a beautiful state but it was lump free. 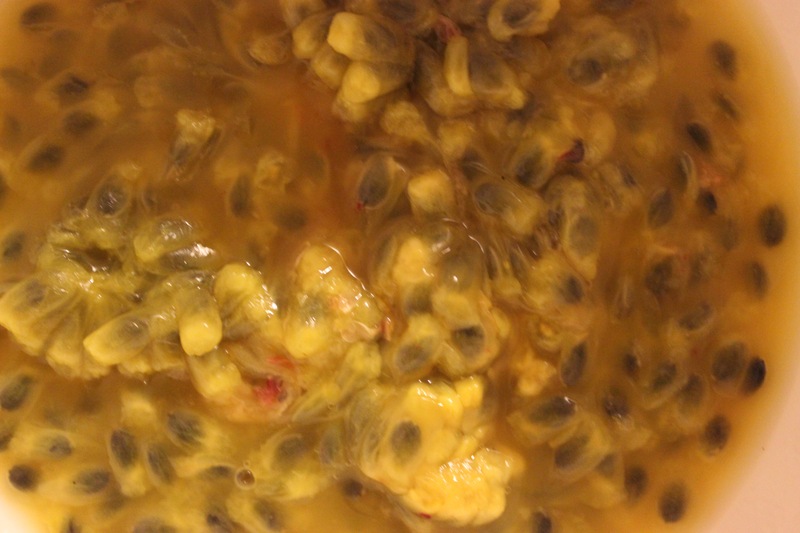 To make the passionfruit juice which is in the cream you scooped out about 6 passionfruit, whizzed in a blender and then strained- smelt just like summer. 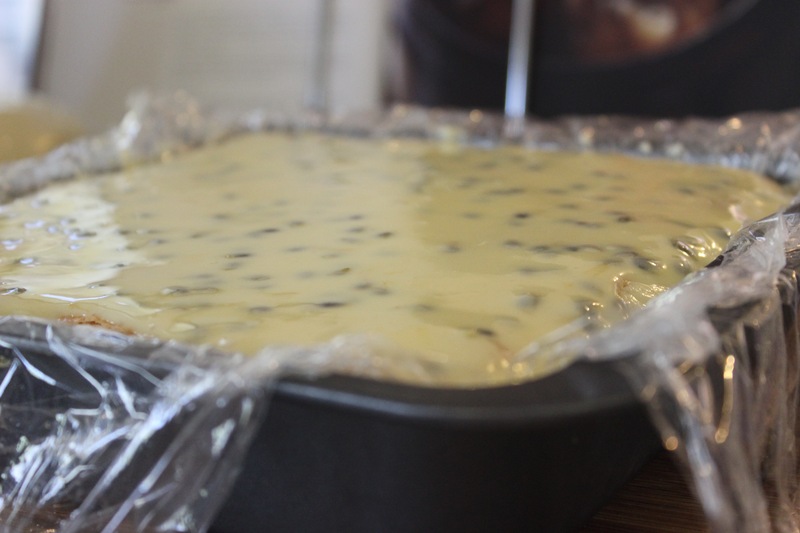 Before you start to assemble make sure you line the pan really really well with either baking paper or glad wrap- you need enough to grip onto when you need to lift it out of the pan to slice. Assembly was easy- pastry, cream, pastry cream, pastry, cream and then pastry- set for a while and then get started on the icing. I’m always amazed at how little liquid you need to mix with icing sugar to get it to a spreadable state- 150g of icing sugar and 2 passionfruit left you with a beautiful yellow icing that smelt so so good- spread a thick layer on top and all you need now is a little more patience for it to fully set. I let mine set in the fridge overnight- and because I was worried it might be a little wobbly I popped in the freezer for about 30 minutes before slicing. ﻿It lifted out of the pan easily thanks to the substantial amount of glad wrap used and I fired up the newly purchased electric knife. Best purchase EVER! This just sliced through it like a breeze and I have a feeling I might just have a need to use it on everything now. So the end result? Pretty good- still needed a knife and fork to eat it properly (sacrilege I know!) but taste wise it did the job- thank goodness you could taste the passionfruit! I think next time I make it I’ll do the traditional 2 slices of pastry and may also look for more of a custardy recipe for the filling. I still have some more left in the fridge which I am more than fine with- I think it was even better tonight than it was yesterday so logically speaking tomorrow’s should be the best yet! I have a long list of recipes that I want to make, one day… just not at the point in time when I read it. It’s either start this recipe 24 hours (min) beforehand (when I want it that day), too complicated a method to deal with and I’m reading the recipe late in the afternoon or a range of ingredients I just don’t have the time to go and source. So this list is a long one, it’s not one central list, it’s scattered over Pinterest boards, ear marked in magazines and I know where they all sit in my cookbooks. But every now and again I do knock them off one by one. 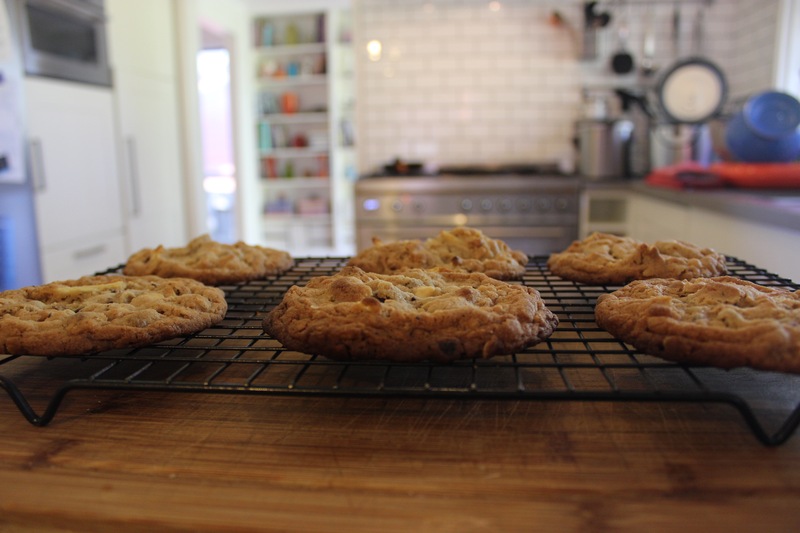 On the weekend I made compost cookies﻿– the recipe is ﻿by Christina Tosi who originally started out at Momofuku and makes amazing things like cereal milk soft serve and crack pie (also on the list). 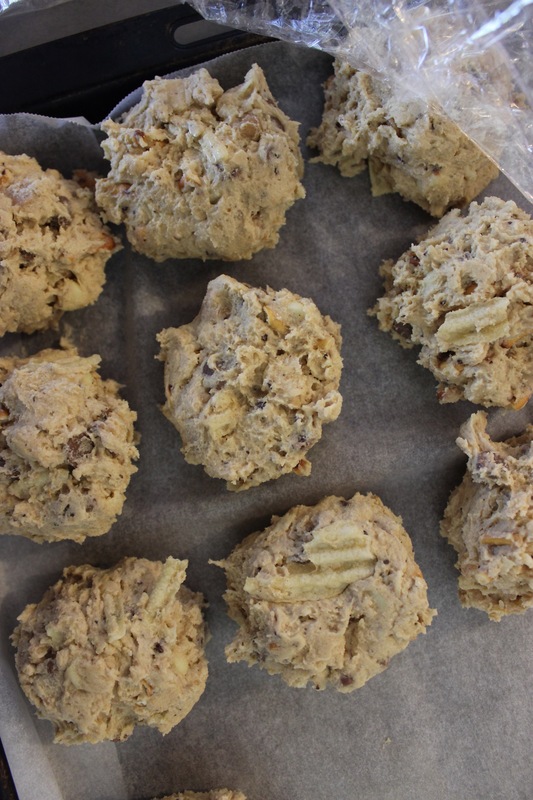 Compost cookies have been on the list for a long time…. in 2012 I first read about it in Gourmet Traveller where they featured Christina because she’d just released her Milkbar cookbook. What I loved about it was the crazy combination of ingredients, a range of chocolate chips, pretzels, coffee, potato chips and a graham cracker crumb. 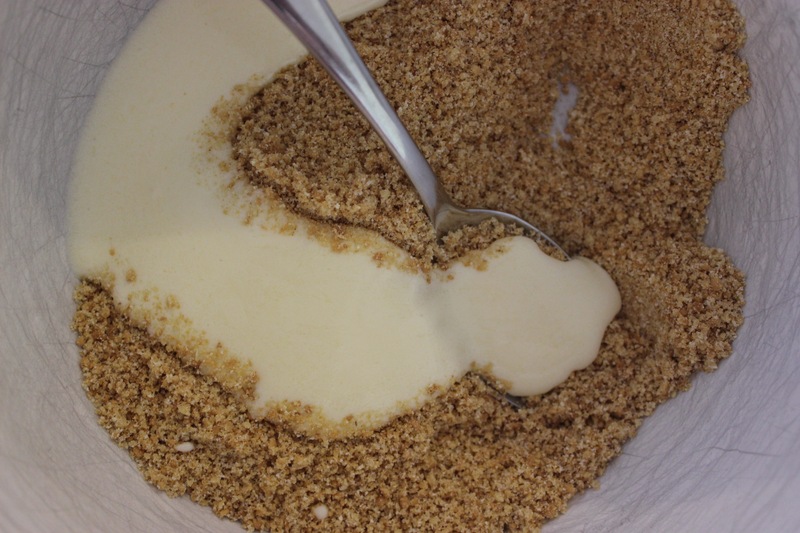 You first start with making the graham cracker crumb- whizz up the biscuits to crumbs and mix through sugar, milk powder, cream and melted butter and stir until it forms small clumps- these are mixed through the biscuit batter later- in hindsight I think that they mooshed into the mixture and became lost so I think next time I might crumble it over a baking sheet and bake until slightly crispy and then mix through. Then it’s onto making the basic biscuit base, cream butter with sugars, add egg, flours etc. 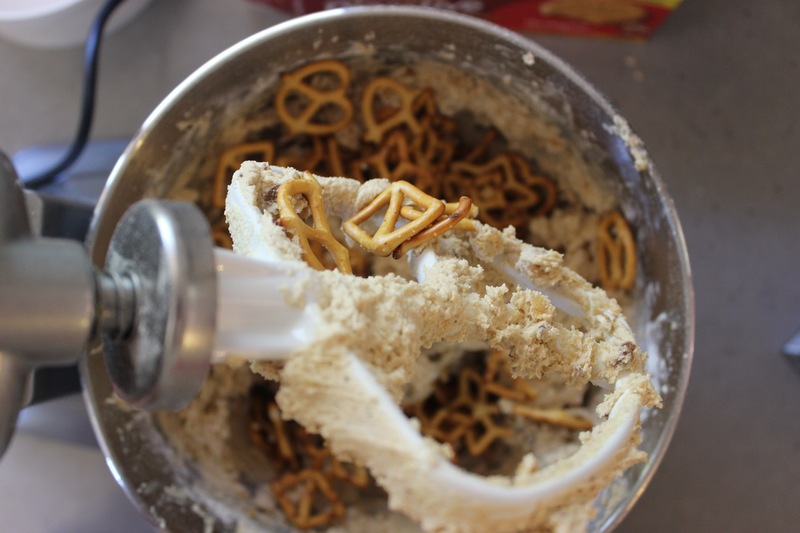 Then came the fun bit, very carefully mixing through the choc chips, graham cracker crumbs, pretzels and potato chips- the kitchen aid did minimal rotations because i didn’t want to decimate the chips! The mixture needs to be shaped and chilled before baking- they call for using a 70ml icecream scoop but I just used a 60ml cup measure- I am so glad I used something slightly smaller because the cookies are HUGE! Stack on a tray and chill for at least an hour. When baking them make sure you give yourself plenty of room between each one, don’t try to cram more on, just be patient and be prepared to bake several batches of cookies. The first lot I cooked for too long but then for the next ones I took them out when the edges were just golden, middle still pale and puffed up, and when it cooled it deflated and all the nice chunky bits started to stick out. So- do I think you would you eat these and go- oh my goodness I can totally taste the pretzels, chips, coffee etc!? No,but I think that what you do end up with is a beautiful salty sweet flavour and a great texture of crunchy and soft- so this recipe will move from the make one day list to the make again list.